This is an article by a service dog owner explaining some answers on frequently asked questions about these amazing pets from her own perspective. 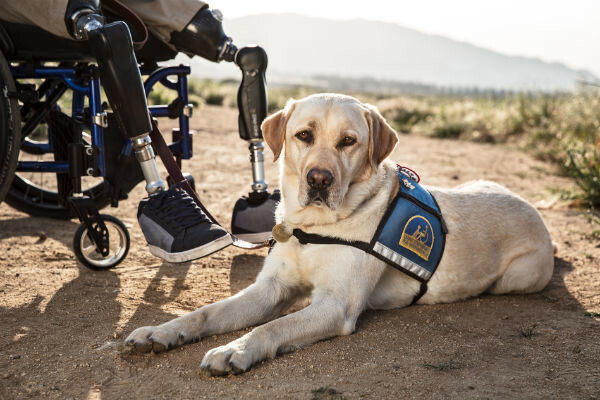 Service Dogs come in all shapes, sizes, breeds, colors, coat types and specialties. You cannot identify one by sight alone and it doesn’t matter if you think my partner doesn’t “look like” a Service Dog. Unfortunately as well, fake Service Dogs are relatively common, and they do a lot of damage to legitimate teams. Please don’t judge my obviously well-trained, well-mannered, quiet, well-groomed, highly responsive Service Dog based on the behavior of an untrained, spoiled pet someone claimed was a “Service Dog.” Behavior tells all, and I ask that you not compare me to any other Service Dog handlers or teams you may know or may have met, because not all Service Dogs are the same. ​“Any dog that is individually trained to do work or perform tasks for the benefit of an individual with a disability, including a physical, sensory, psychiatric, intellectual, or other mental disability. Other species of animals, whether wild or domestic, trained or untrained, are not service animals for the purposes of this definition. The work or tasks performed by a service animal must be directly related to the individual’s disability. Examples of work or tasks include, but are not limited to, assisting individuals who are blind or have low vision with navigation and other tasks, alerting individuals who are deaf or hard of hearing to the presence of people or sounds, providing non-violent protection or rescue work, pulling a wheelchair, assisting an individual during a seizure, alerting individuals to the presence of allergens, retrieving items such as medicine or the telephone, providing physical support and assistance with balance and stability to individuals with mobility disabilities, and helping persons with psychiatric and neurological disabilities by preventing or interrupting impulsive or destructive behaviors. The crime deterrent effects of an animal’s presence and the provision of emotional support, well-being, comfort, or companionship do not constitute work or tasks for the purposes of this definition.” Miniature horses have been added as a specific provision to the ADA. The miniature horse must be housebroken, under the handler’s control, can be accommodated for by the facility, and will not compromise safety regulations. Any animal that is individually trained or able to provide assistance to a qualified person with a disability; or any animal shown by documentation to be necessary for the emotional well-being of a passenger… Psychiatric service animals are recognized as service animals, but are considered to be emotional support animals and, therefore, subject to the applicable regulatory requirements, i.e. documentation. ​An emotional support animal (ESA) may be an animal of any species, the use of which is supported by a qualified physician, psychiatrist or other mental health professional based upon a disability-related need. An ESA does not have to be trained to perform any particular task. ESAs do not qualify as service animals under the Americans with Disabilities Act (ADA), but they may be permitted as reasonable accommodations for persons with disabilities under the Fair Housing Act. The Air Carrier Access Act provides specific allowances for ESAs traveling on airlines, though documentation may need to be provided.